I first made this fruity guacamole recipe back in January for a live morning TV segment I did on Univision about Super Bowl party foods. 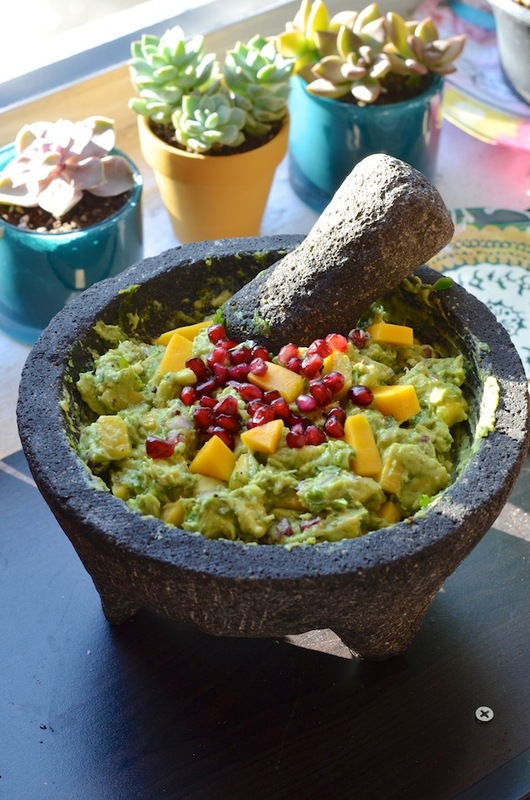 The theme was party foods with a twist, so I shared this Guacamole with Fresh Mango and Pomegranate. The recipe was a hit that day. So much so that as I sat in the break room at the station sipping coffee and waiting for my car service, I watched as one-by-one the producers, camera operators, and even the anchors came into the kitchen to serve themselves a plate of the leftovers from my set. By the time I left, the bowls were totally clean and people were asking if I had anymore. I was inspired to make this guacamole again last weekend after I received my first box of goodies from a new subscription box company called Hampton's Lane. This really cool service delivers a box of curated ingredients and kitchen gadgets based on a different monthly theme. This month, the theme is Southwestern Fiesta, and the box (2 boxes, actually!) arrived with a jar of spicy Mexican salsa, two different spice mixes, a jar of Salt Trader's Pink Margarita Salt with Chipotle, a bright green lime juicer, and a GORGEOUS authentic Mexican molcajete. There are a billion different subscription services out there, but I was really impressed with the quality and value that came in this box (those molcajetes alone are often sold for up to $50!). In fact, I reached out to them and asked them if they could offer up an exclusive discount code for my readers and they agreed. 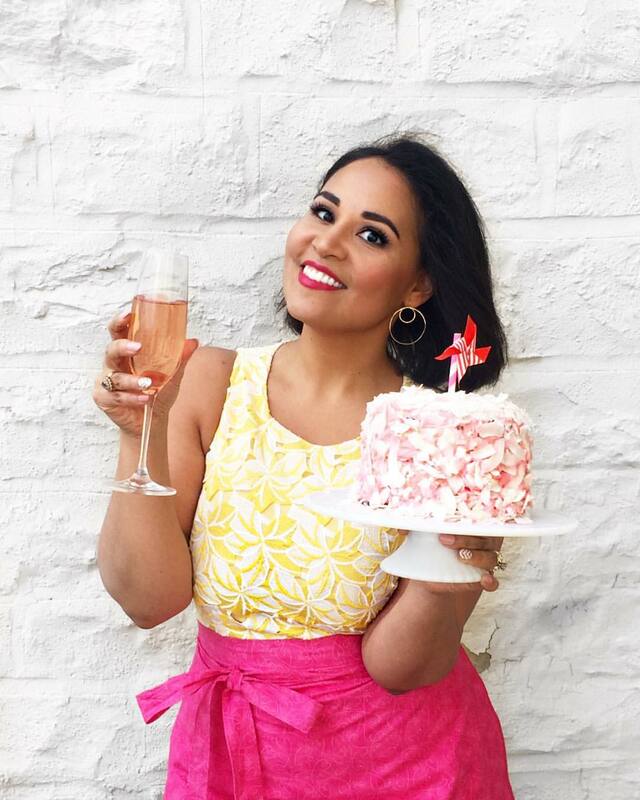 So if you're interested in trying out a Hamptons Lane box, pop on over to their website and use the code "CincoDeMayo" and you'll save $10 off your first box, so you'll only pay $35 and get $75+ worth of goodies. As you may have heard, there is a lime shortage going on here in the US, thanks to a mix of bad crops and crazy Mexican cartels who are literally holding limes hostage (seriously?!). The cool thing is that the tart pomegranate and fresh mango actually mean that you have to use less lime juice than you typically would for this recipe. Combine the onion, jalapeño, salt, and 1/2 the cilantro in a molcajete or bowl and mash together to form a paste. 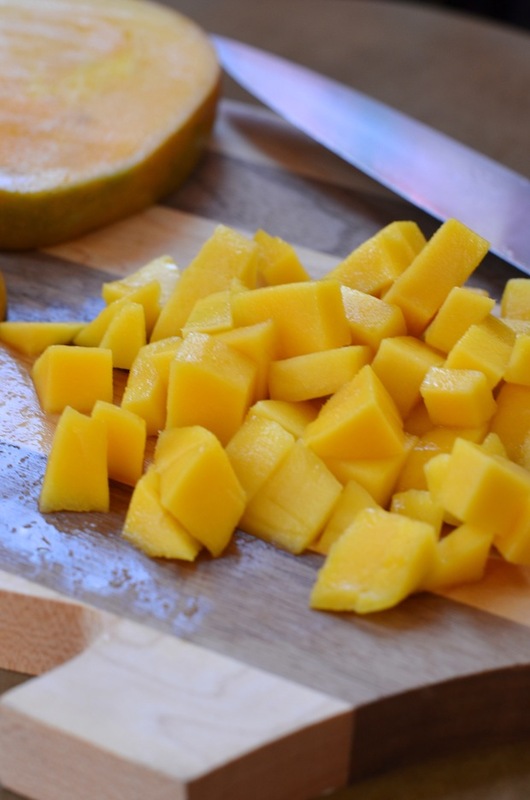 Fold in the diced mango, pomegranate arils, and remaining cilantro. Mix in the lime juice, and then taste and adjust seasoning if necessary.